Kitchen is a place where we consume food and prepare delicious food. The interior of the kitchen has faucet, island, dining table, cabinets, counter, loft, chimney, micro wave oven, stove, dish wash detergent and some indoor ornamental plants for a fresh look. The minimal style bedroom includes only few things which gives an elegant look. The minimal style is decorated with neutral colors or based on your interest and this style gives a classy look. The kitchen room may be of different shapes and have an island along with the kitchen set which can be used for consuming food. The false ceiling is designed with simple light fixtures such as pendant lights. In the view of the image you can see a minimal interior design of a kitchen which is amazing with Barbour green cabinets. The false ceiling is a dry wall ceiling with hanging lights attached to the roof and the flooring is made of plain vinyl flooring with a glossy finish. The kitchen is I shaped kitchen which occupies small space and the void can be filled with the kitchenware. 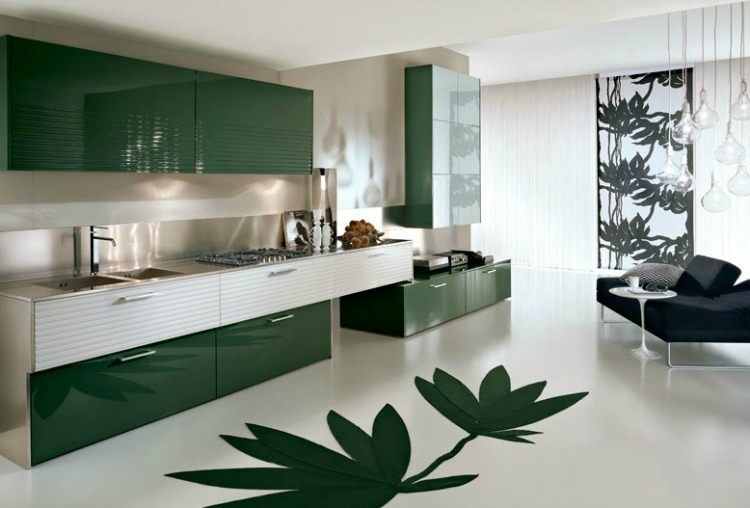 The room has green cabinets with a jazzy look and the counter is made of a metal. There is a faucet, stove, sink and the oven can be placed inside the cabinets or on the counter. There are sheer draperies covered and a comfy couch is arranged for seating. This image views you a stunning kitchen interior of minimal style. The false ceiling is a dry wall ceiling and the flooring is made of ceramic tiles. The kitchen room has an island and dining table which could be easy to serve. The entire design is in the combination of black and white which is sprucing the interior. The interior has wall panelling of black color where the micro oven is inbuilt. The island in the room can be used for preparing food and stores the messed things in it and the dining is used for ingesting the food. There is an ultra modern Harlequin green arm chair. The false ceiling is pop ceiling suspended under the structured ceiling which has simple light fixtures and unseen lights which illuminates the whole room. The flooring is made of white ceramic tiles and has a striped carpet laid on it. The kitchen is L shaped kitchen with an island and dining table with wooden chairs on it. The room has wooden cabinets for storing kitchen ware and there is a inbuilt micro wave oven. There is a metal made chimney above the stove which makes the room oil and smoke free. It has an island for preparing food and the dining for consuming food. The interior of the room is decorated with snowy white color and has dark brown cabinets in contrast and is elegant. The false ceiling is a drop out ceiling with simple light fixtures and the flooring is made of beige ceramic tiles. The room has decorated with light and dark brown cabinets for storing groceries and has an inbuilt micro wave oven and OTG. The kitchen is L shaped kitchen with an island which can be used for preparing food or for having casual drinks. There is a faucet, chimney and ornamental plants for a fresh look. There is a long dining adjacent to the kitchen room. 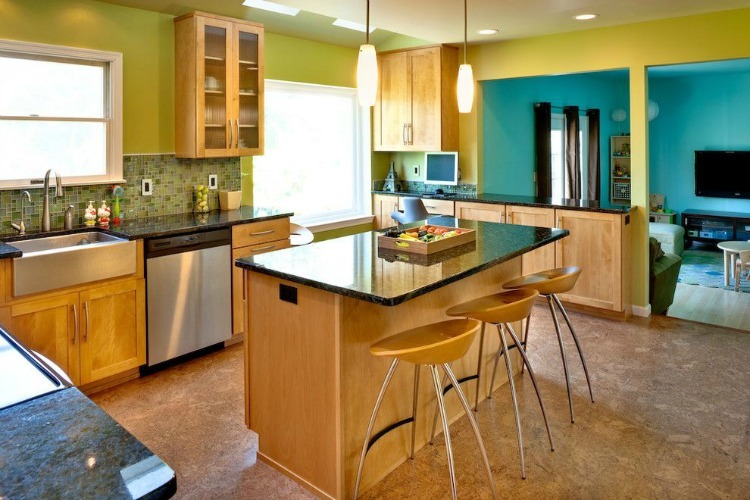 This image is a colorful and minimal kitchen interior. The false ceiling is a dry wall ceiling with simple light fixtures and has pendant lights attached to the roof. The room is C shaped with an island and there are double hung windows which allows fresh air into the room. The room has cabinets with faucet for storing groceries or accessories and the island can be served with drinks and edible items. The flooring is a textured vinyl flooring of dark beige which matches the room and the kitchen is adjacent to the living room. It is an open kitchen and has space for placing a computer for entertainment. The entire kitchen is decorated with snowy white and the false ceiling is dry wall ceiling. The flooring is made of white ceramic tiles and there is an I shaped kitchen with a dining table in the midst which is outstanding. The room has void space without any extravagant materials and gives a minimal appearance. There is wooden cladding on to the wall with an inbuilt micro wave oven. The room has counter with stove, faucet, sink, vessels and cabinets for storing groceries. There are closets for placing accouterments or decorative items. In the view of the image you can see a minimal style kitchen design with swivel bar tools. 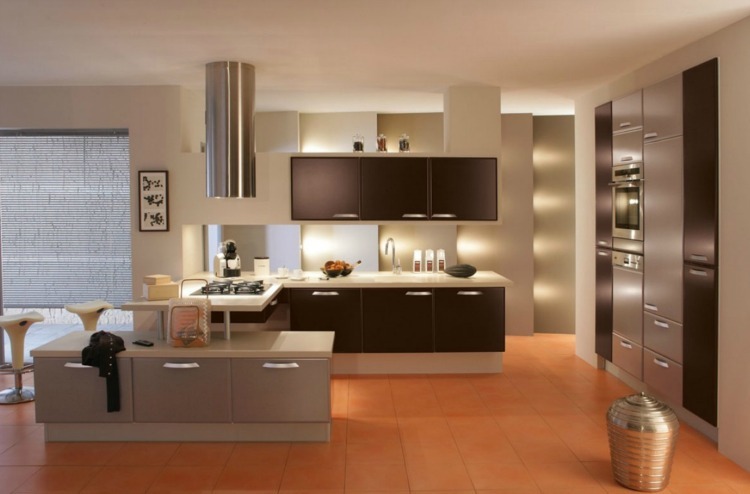 The kitchen is L shaped kitchen with flat panel wooden cabinets. The kitchen has island with stools for having casual drinks and the false ceiling is a dry wall ceiling with simple light fixtures. The flooring is made of laminated walnut wood. There is an inbuilt micro wave oven which is quite popular and has a metal made chimney. It has closets with ceramic bowls placed on it and has ginger jars, ceramic utensils, faucet on the counter. In the view of the image you can see a minimal kitchen interior. The false ceiling is a dry wall ceiling with recessed lights and has red cabinets with inbuilt micro wave oven. The walls of the interior is decorated with light grey wall paper and has cabinets for storing appliances or metal ware. The flooring is made of laminated oak wood and has metal chimneys attached to the roof. The kitchen is L shaped with island on which edible items, stove are placed. The kitchen has dining table with most popular rectangular dining table with metal leg chairs and the room is decorated with sara paloma pottery. The interior of the above kitchen gives a minimal appearance and the false ceiling is a dry wall ceiling. The flooring is made of tiles and the room has counter with bar stools. There are cabinets on the wall with a inbuilt microwave oven and has photo frames mounted on the wall. The kitchen has faucet, stove, ceramic jars and wooden cabinets. The interior is decorated with blinds and has a dura vent chimney attached to the roof. The interior has unseen lights attached to the walls which creates a dramatic effect. The interior design of the rooms looks bright with candy red cabinets and is decorated with casement windows. The cabinets are made of wood and glass and can be used for storing kitchen ware. 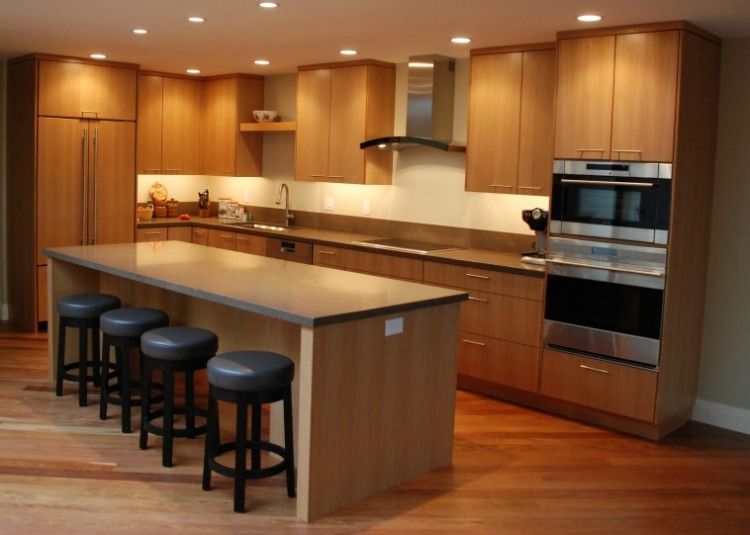 The kitchen is L shaped kitchen with an island on which stove is placed and has chairs arranged for seating. The counter has faucet, glass jars, appliances and the metal chimney is attached to the roof. The flooring is made of white ply wood and the interior gives an outstanding look by the colorful cabinets and is minimal.